What is spray jet control? When spray systems are used the size of the spray cone and the spray quantity must match the respective application. The geometry of the spray cone and the spray quantity also depend on the medium that is used (primer, adhesive, solvent, water, alcohol, paint, etc.) and on the spray nozzle outlet, on the overpressure, and on spray quantity dosing. 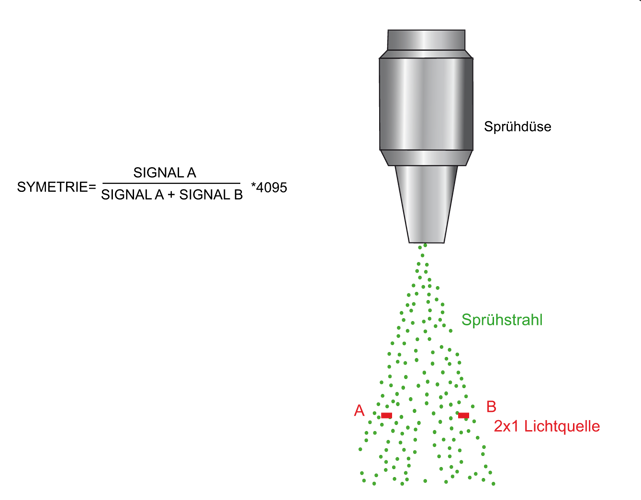 Especially if adhesive is sprayed, part of the spray nozzle outlet may get clogged, which results in a change both of spray quantity and spray geometry. The spray jet may thus be changed both in its direction and in the opening angle. 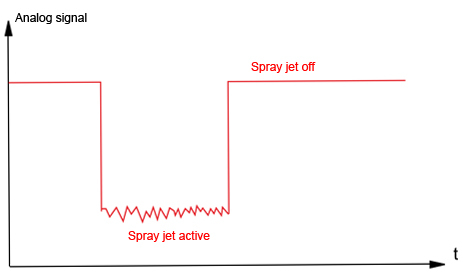 A spray jet control system in time informs the user about such a change of the spray jet. What does a spray jet look like? 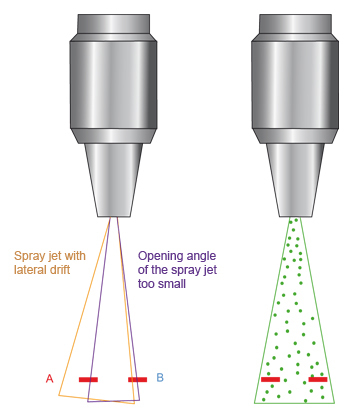 A spray jet as a rule is a "loose formation" of small droplets (sized between some micrometres and some hundred micrometres, depending primarily on the sprayed medium) that are generated at the spray nozzle outlet due to atomisation of the spraying agent. 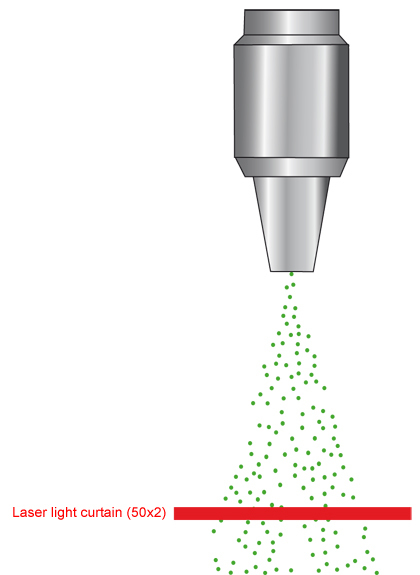 These droplets exit from the spray nozzle outlet at a certain speed and are then decelerated due to air friction. 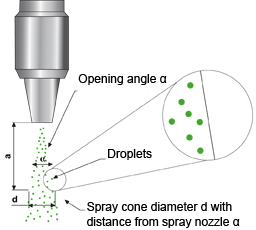 The spray jet is defined by the opening angle of the spray cone and by the spray quantity (droplets / time unit or spraying agent throughput). How is the spray jet controlled? 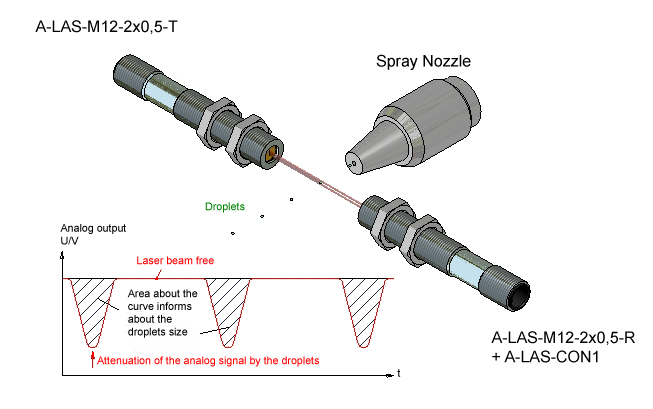 Information about the spray quantity for example can be obtained by using a laser beam that at least partially passes through the spray cone. On its way through the spray cone the laser beam is deflected by the individual droplets. 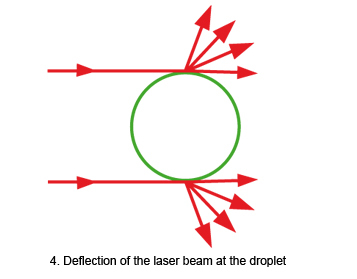 This deflection is caused by reflection at the droplets or by focussing of the laser beam, because the droplets, if they are optically transparent, function like micro-lenses. Some of the light also is absorbed by the droplets. In total, less light arrives at the opposite side of the spray jet. 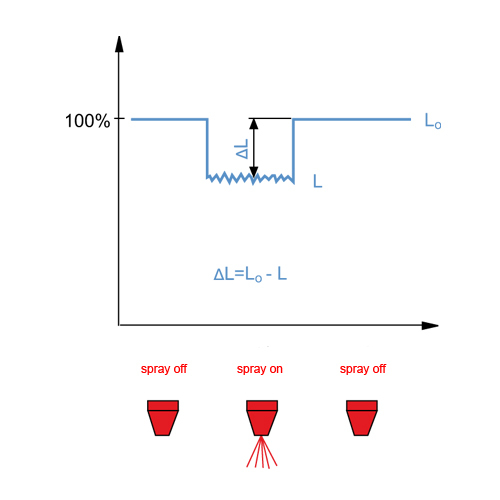 The signal decrease compared to the absence of the spray jet is used as a measure for the spray quantity. 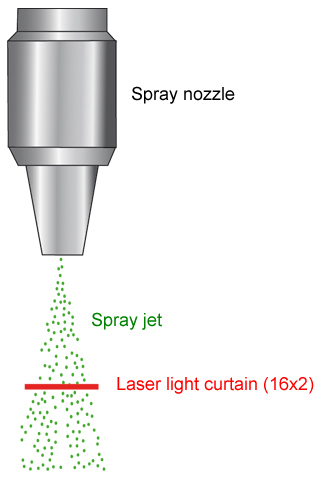 This method primarily is used if only information about the spray quantity is required, or about the presence of a spray jet. Apart from spray quantity control this method also to a limited extend is suitable for symmetry control. 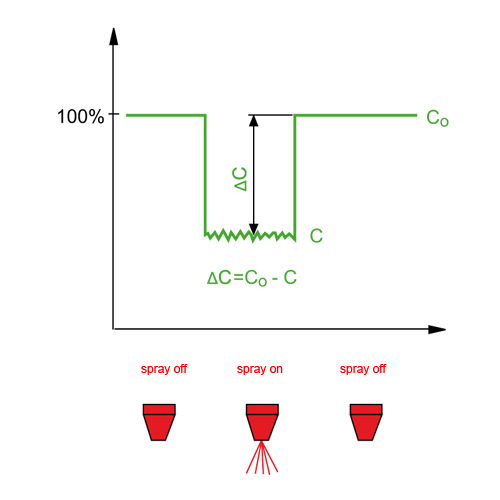 A lateral drift of the spray cone already can be detected with this method. 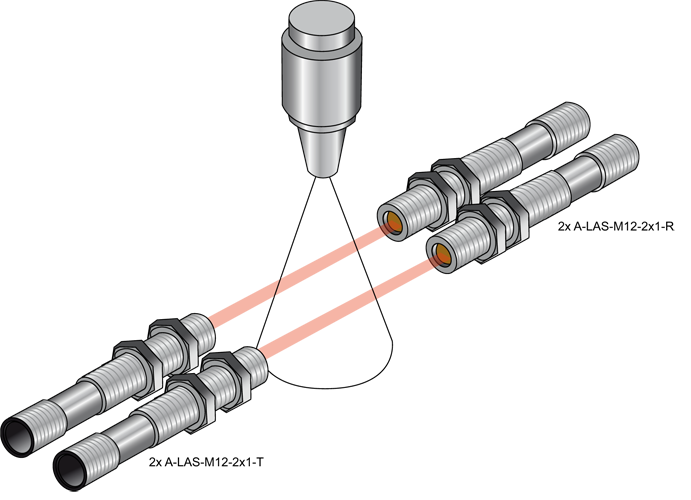 The two-beam system primarily is used if a simple but cost-effective way of monitoring the spray cone symmetry is required. In both modes the spray jet density (DENSITY), the relation of the two edge beams (SYM1), and the relation of the centre beam to the two edge beams (SYM2) are evaluated. L, C, R are the raw values of the 3 channels with a value between 0 and 4096 (12 bit). In RELATIVE mode the relation of the respective raw values L, C, R during spraying to the raw data L0, C0, R0 that are present when spraying is inactive, is formed. The raw data L0, C0 and R0 thus each represent the 100% value! 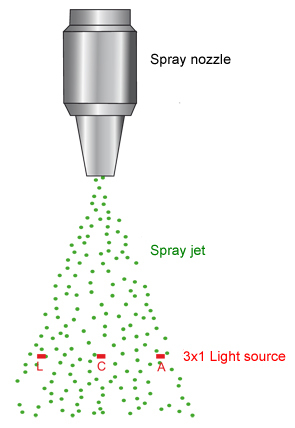 With this method a continuous light-band is directed onto the spray jet. 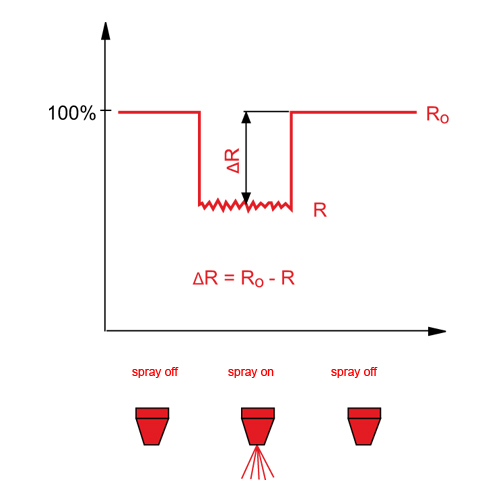 As a rule the light-band is wider than the spray cone diameter, which means that the spray jet is fully detected. At the opposite side of the spray jet there is a receiver that is designed as a line sensor with more than 1000 individual miniature detectors that are arranged in a row. 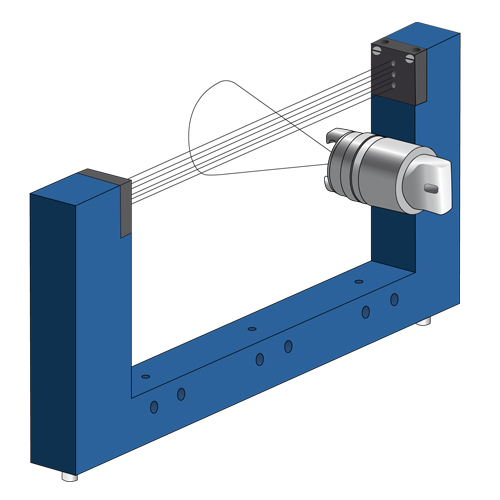 This allows a gapless evaluation of the spray jet profile. 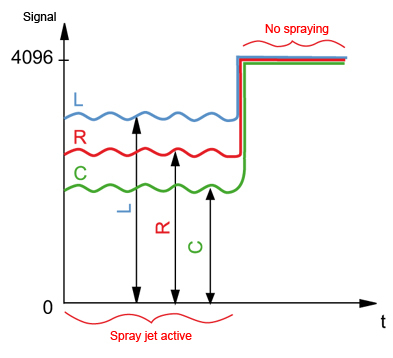 The percentage difference of the two video signals (line signals) that are recorded before spraying and during spraying, is used to determine the jet profile. 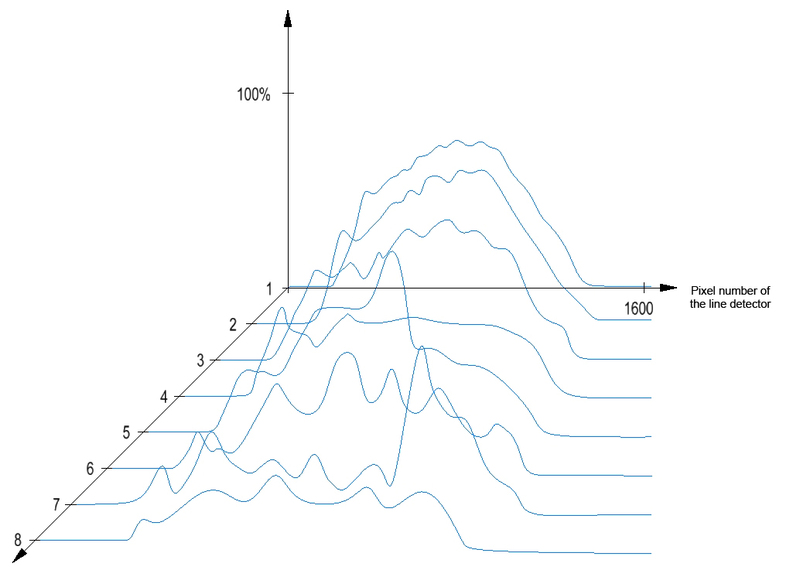 The beam profile provides information about the local distribution of the spray medium in the spray jet. 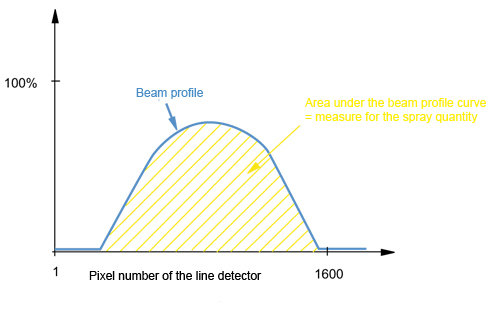 The area under the beam profile curve informs about the spray quantity. The recording of successive scans allows the creation of a kind of film. This method therefore is ideally suited for studying possible influences such as pressure changes, spray quantity changes, changes of the spray medium, and changes of the nozzle outlet. Optical fibres are used to allow spray jet control also in environments where there for longer periods of time is a dangerous explosive atmosphere in the form of a mixture of air and combustible gases, vapours or mists. 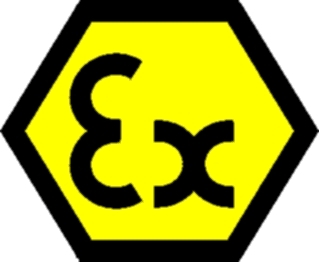 Spray jet control thus also is possible in explosive zone Ø of the ATEX guideline. 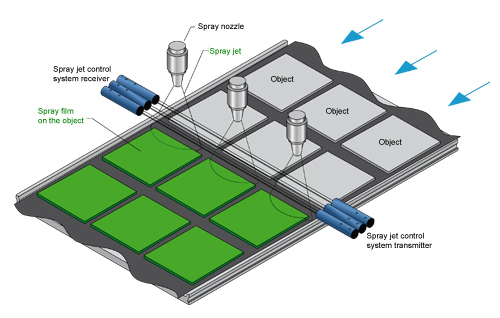 The electronic and opto-electronic components of the spray jet control system are located outside zone Ø. 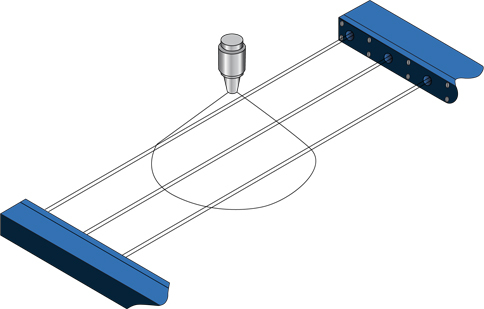 Only the optical or opto-mechanical components (opto-mechanical frontend) are located in the area. 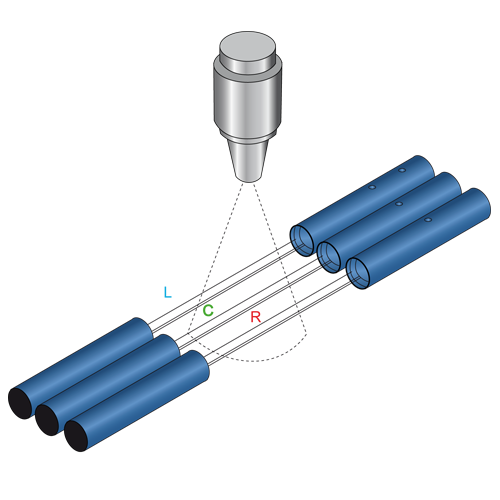 The connection between frontend and evaluation unit is established by way of optical fibres. Care must be taken to ensure that the optical power density does not exceed a certain limit. The optical power density of SI products is far below the permissible limits. The object to be sprayed is positioned. During the spraying process the object remains at its position. 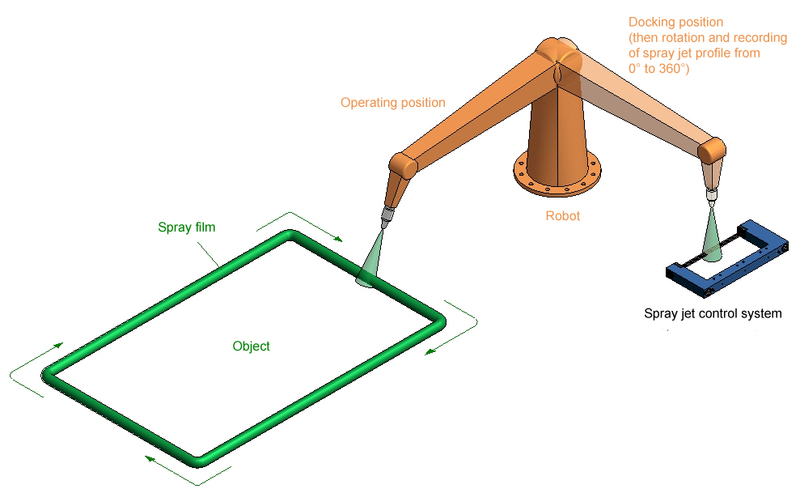 The spray jet control system is located in a so-called docking station, which the robot approaches after the end of the spraying process at the object. When the docking position is reached, the spray nozzle is activated again, and the spray jet is controlled during this time. In practice the robot does not approach the docking position after every object, but for example after every 10th object. If the spray jet control system should provide a NOK signal, the normal operating sequence will be stopped. The spray nozzle is stationary, and the object is moved under the spray nozzle. A conveyor belt for example transports the objects through the spray jet. The nozzles are firmly mounted, which means that monitoring must be performed during the normal spraying process. Calibration only is possible after the spray nozzles are turned off (or before they are activated). It also must be considered that it may be necessary to simultaneously monitor several spray nozzles with the same control system. 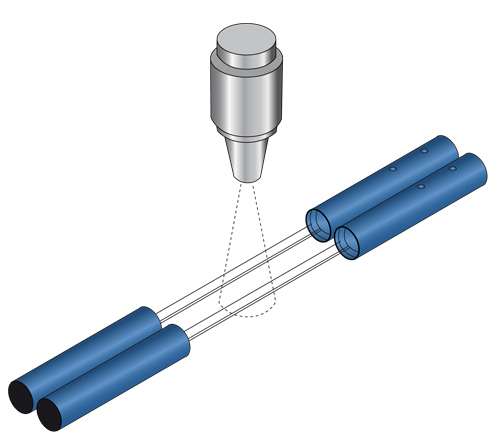 With a solenoid valve individual "packages" or droplets are generated from a very fine nozzle (a piezo print head would be another possibility to generate droplets in rapid succession). On the one hand the number of droplets must be determined, and on the other hand the diameter of the droplets or the size of the "packages" must be monitored. 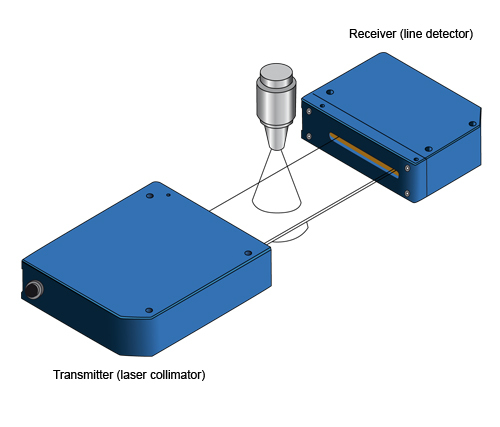 The ideal sensor for this application is a sensor of the A-LAS series with an aperture that is matched to the droplet size, in combination with the A-LAS-CON1 control unit, because this sensor system features a high scan and switching frequency. At the analog output the droplet size is buffered until the next droplet arrives. When not attenuated the sensor supplies an analog signal of +10V (can be set by way of the laser poser at the Ι-Control-Pin). The decrease of the analog signal during the spraying process provides information about the spray quantity. Blast-air top parts ABL-M12-3 are used to prevent the depositing of droplets on the optics covers of transmitter and receiver. As a rule a slight overpressure is sufficient for this purpose. With the help of the controller incl. the A-LAS-CON1-Scope software the system can be calibrated before the actual spraying process. 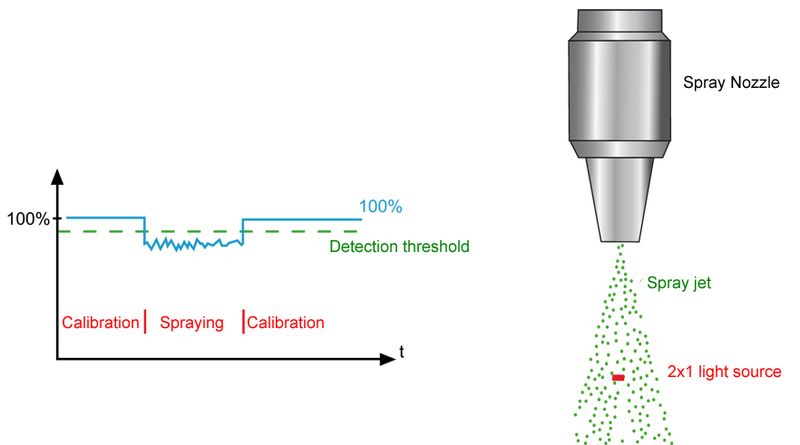 This makes it possible to even detect smallest spray quantities, because possible dirt accumulation can be compensated by way of calibration (to 100%), and the detection threshold can thus be close to the 100% value (e.g. 99.7%). The controller unit provides both an analog signal and a digital signal output that inform whether the value fell below the detection threshold. 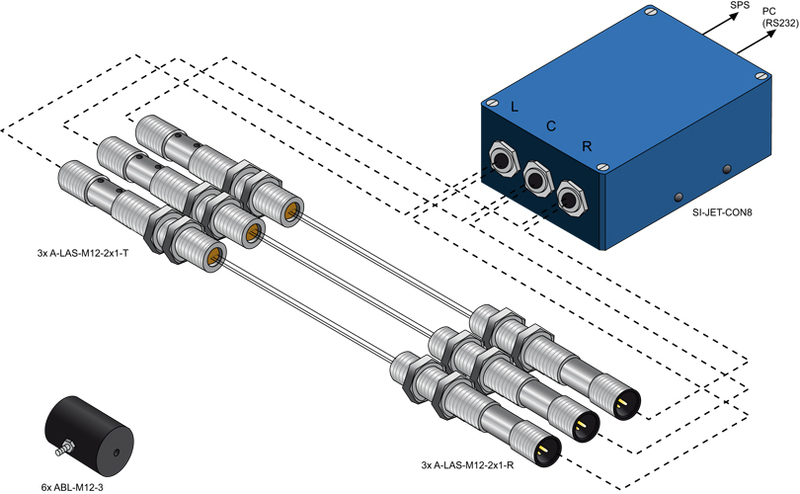 The two A-LAS laser sensors are controlled and evaluated by the A-LAS-CON1 control unit. 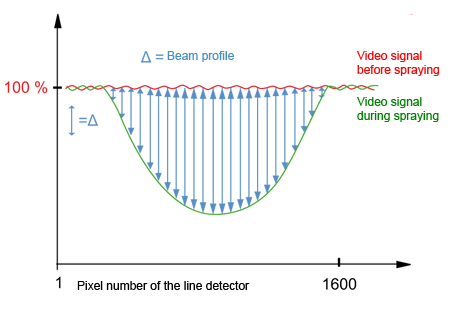 Calibration is performed between the actual spraying processed, triggered by an external digital signal (e.g. from the PLC) that informs the controller when calibration can be performed. 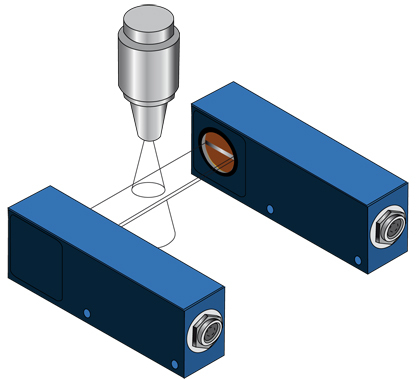 The two laser sensors can be used to carry out a simple symmetry check. The spray quantity also can be monitored. 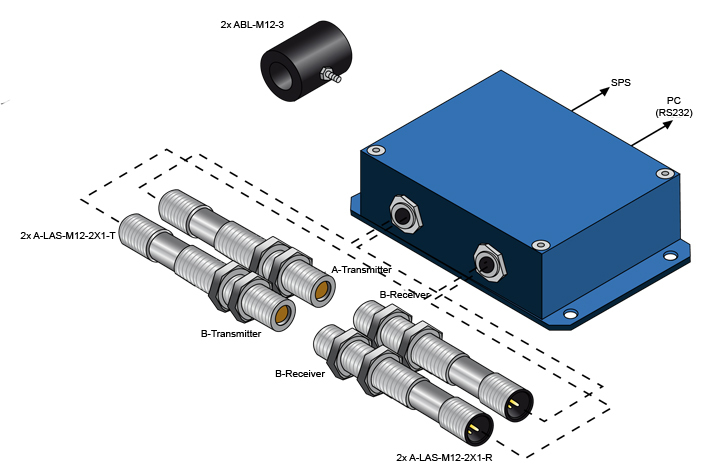 Blast-air top parts ABL-M12-3 are used to prevent dirt accumulation on the optics covers of the laser sensors. SIGNAL A OK / NOK. SIGNAL B OK / NOK. 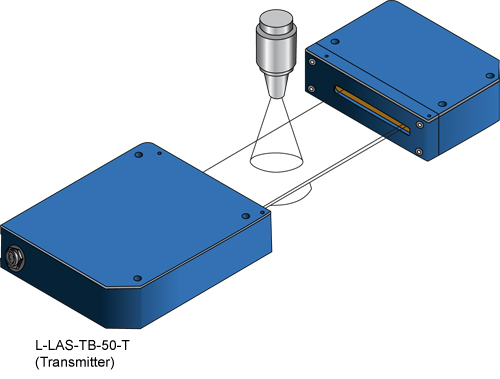 The system checks whether SIGNAL A, SIGNAL B, and SYMMETRY lie in the specified tolerance range. 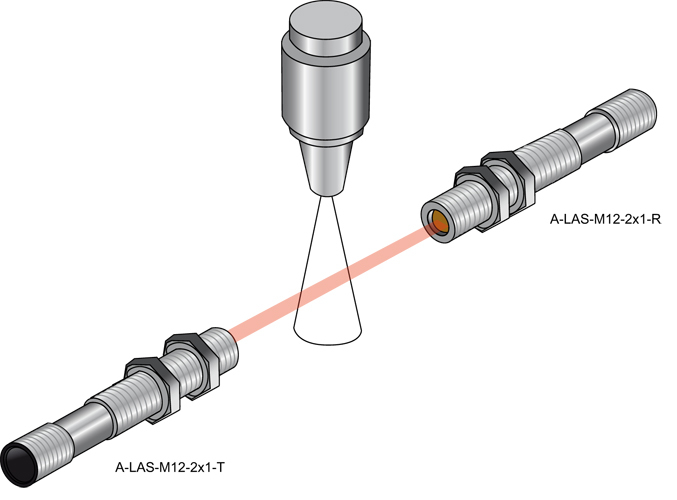 Sensor type: Optical fibre D-S-A2.0-(2.5)-500-67° + attachment optics KL-M18-A2.0 (2x) + control unit A-LAS-CON1-FIO. A-LAS-CON1-FIO performs control and evaluation operations in the same way as A-LAS-CON1. 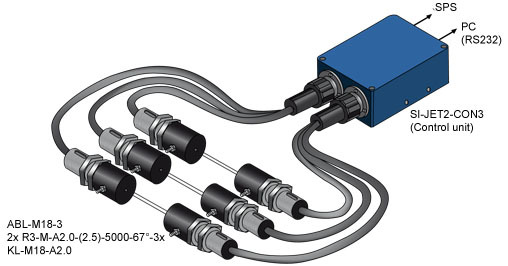 Since in this case the electronic and opto-electronic components are integrated in the control unit and not in the sensor frontends, this type is suitable for operating in Ex areas. Blast-air top parts of type ABL-M18-3 are used to protect the optics units. 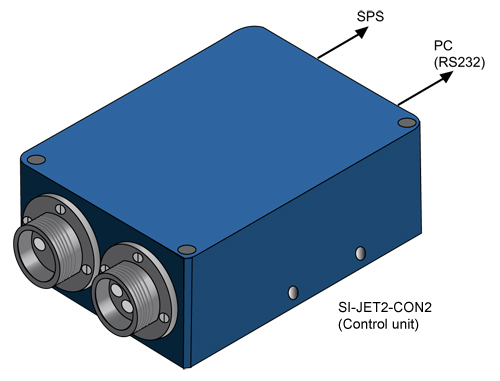 The three sensor frontends are evaluated by the SI-JET3-CON8 control unit. The SI-JET2-Scope V3.0 software is used for evaluation purposes. 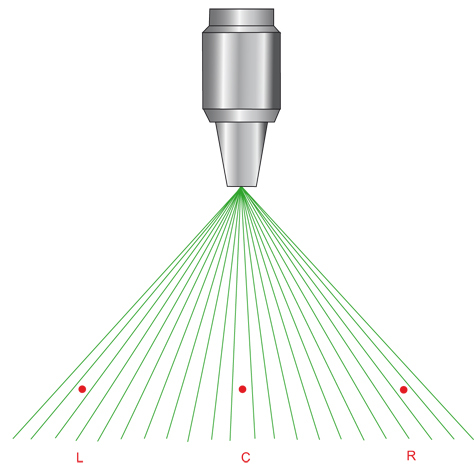 Both the spray quantity (DENSITY) and the symmetry (SYM1, SYM2) can be evaluated. In RELATIVE evaluation mode dirt accumulation is compensated by way of automatic calibration. 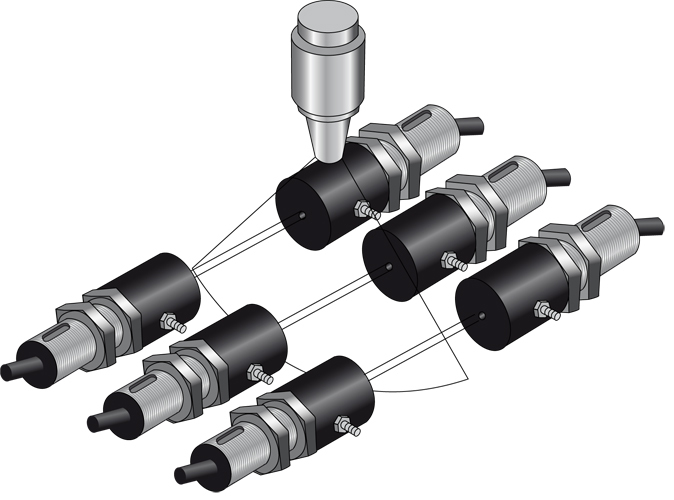 Up to 31 different spray jet tolerances can be specified, and the 5 digital outputs can thus be used to inform about a drift of the spray jet at an early time. The fork features three light beams, each with a diameter of 3 mm and a centre-to-centre distance of 5 mm. 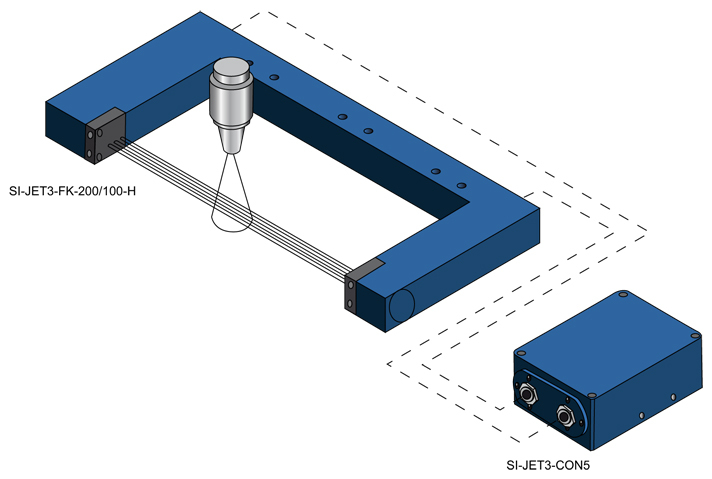 The SI-JET2-Scope V3.0 software is used for the evaluation of the spray quantity (DENSITY) and of the symmetry (SYM1, SYM2). 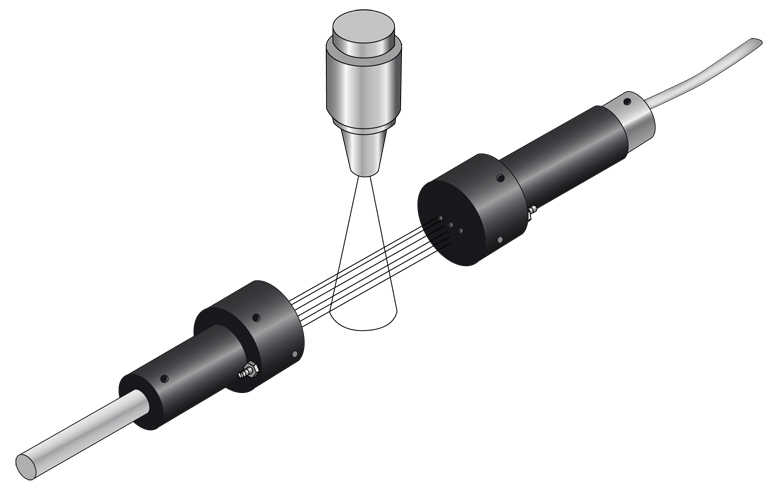 In RELATIVE evaluation mode, which can be used if a spray jet interval lies in the range of one minute, calibration is performed between the spray intervals and thus compensates possible dirt accumulation. 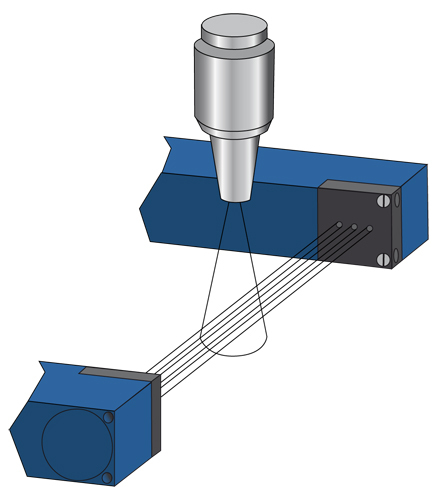 The ABSOLUTE mode is used when there is a continuous spray jet. 5 digital outputs in up to 31 stages provide information about the respective tolerance levels. This also provides an easy way of realising a trend display (e.g. through a PLC). 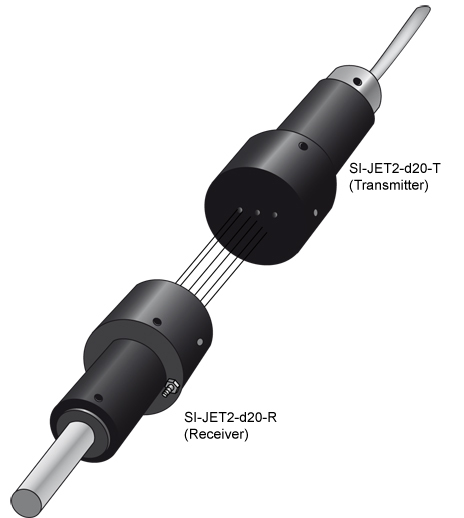 Sensor type: SI-JET2-d20-T (transmitter) + SI-JET2-d20-R (receiver) + SI-JET2-CON2. 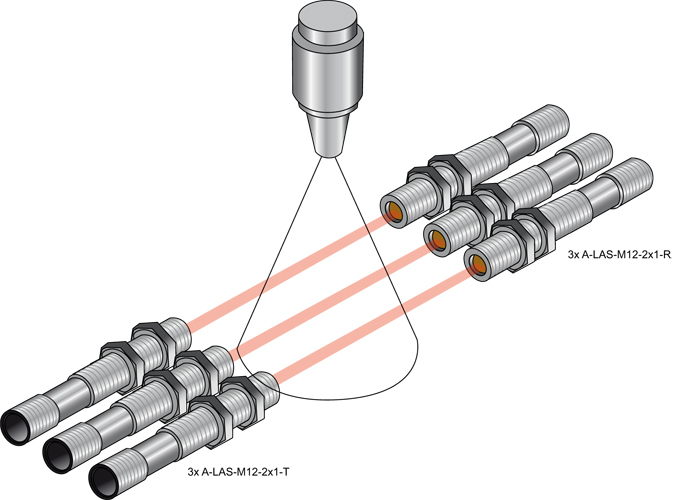 Red light is supplied to the special frontend by way of an optical fibre, and an aperture that is integrated in the blast-air top part generates 3 beams each with a diameter of 3 mm and a centre-to-centre distance of 5 mm. Evaluation is performed with the SI-JET2-Scope V3.0 software. The SI-JET2-CON2 control unit features 5 digital outputs that also can be used to realise a trend display (e.g. through a PLC). 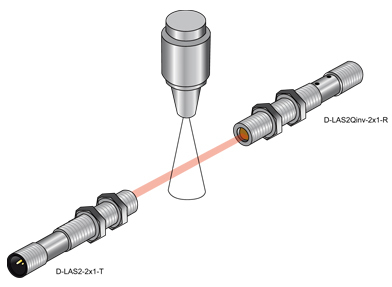 With this sensor type the three red light beams can be individually adjusted to the respective spray jet. The SI-JET2-Scope V3.0 software is used for evaluation. This type offers decisive advantages especially for spray jets that have a large opening angle. In this version the 3 beams also are arranged (centrally) at 5 mm with respect to each other, the red light beam has a diameter of 3 mm. With the help of the SI-JET-CON2 control unit a trend display of the spray jet parameters can be realised, e.g. in combination with a PLC. This type primarily is used for spray jets with a large opening angle. The red light beams have a centre-to-centre distance of 50 mm, the beams have a diameter of 3 mm. With the SI-JET2-Scope V3.0 evaluation software and the 5 digital outputs of the SI-JET2-CON2 control unit a trend display (e.g. through a PLC) can also be realised here. 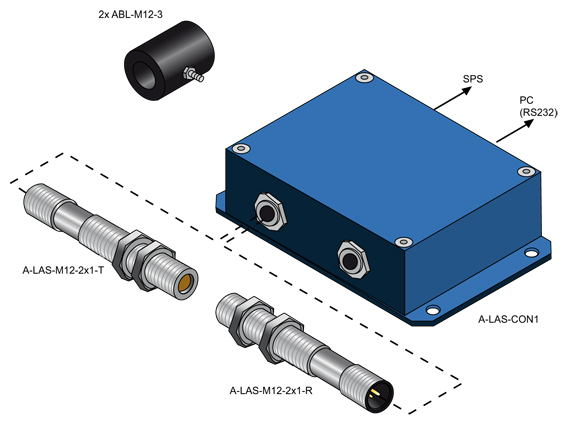 Sensor type: L-LAS-TB/90-16x2-T (special frontend) + L-LAS-TB/90-16x1-R (receiver frontend) L-LAS-TB-16-CON1 (control unit). 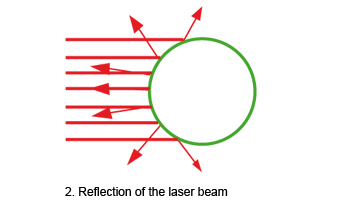 A 16 mm wide laser light band is directed through the cross-section of the spray jet cone. 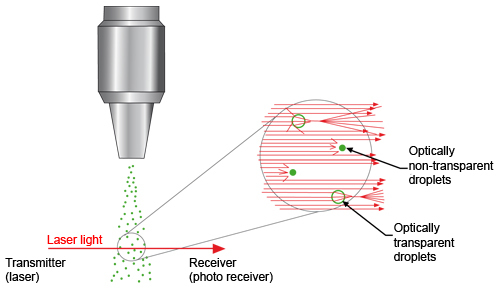 At the opposite side of the spray jet there is a 16 mm wide line detector with 256 pixels (miniature photo detectors) that records the laser cross-section profile. 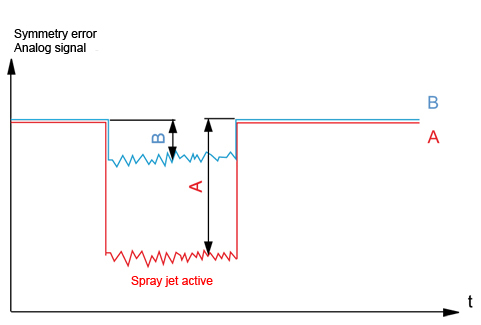 The L-LAS-JET-Scope evaluation software calculates the actual spray jet profile from the difference of the line sensor signal in not attenuated state (spray jet off) and in attenuated state (spray jet on). 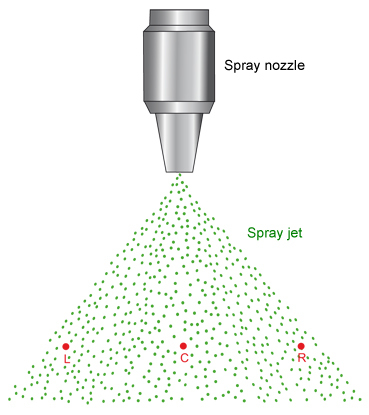 The spray jet profile can be saved in the PC memory as a file with consecutive number, which makes it possible to create a kind of "spray jet profile study". This version operates with a 50 mm wide laser light curtain. The line detector has approx. 800 pixels. 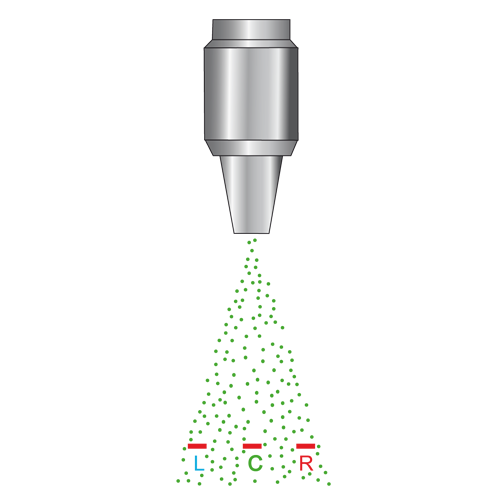 The L-LAS-JET-Scope evaluation software provides a spray jet profile that can be saved in the PC memory as a file with consecutive number, and can thus be used for studying the spray profile. Comparable to the L-LAS-TB-50 type, but with a laser light curtain of 75 mm width and a line detector with approx. 1200 pixels. Comparable to the L-LAS-TB-50 type, but with a laser light curtain of 100 mm width and a line detector with approx. 1600 pixels. In a two-beam system the relation provides information about the symmetry. The data are displayed on the PC screen both in numeric and in graphic form. From the 3 available raw values L, C, R of the three input channels the SI-JET2-Scope V3.0 software determines the spray jet density (DENSITY) as well as two symmetry values symmetry 1 (SYM1) and symmetry 2 (SYM2). In EMA the three raw values L, C, and R are used to determine density, symmetry 1 and symmetry 2: DENSITY= SYM1= SYM2= The current values for DENSITY, SYM1 and SYM2 are displayed on the Windows® user interface in graphic and numeric form. The raw values also are visualised in the form of bar displays. The TEACH table is displayed when the PARA software switch is activated. When the GO button is pressed, the current data calculated in the sensor for DENSITY, SYM1 and SYM2 are displayed on the PC user interface. When the TEACH DATATO button is pressed (mouse click on the Windows ® user interface), the data will be written to the TEACH TABLE. DTO is used to define the tolerance for the density, S1TO defines the tolerance for symmetry 1, and S2TO for symmetry 2. When a state (vector) has been "taught", this information must then be sent to the sensor by clicking on the SEND button. When the GO button is pressed, the current tolerances DTO, S1TO and S2TO are shown in the graphic display. The V-No. : field provides the information whether the current spray jet lies within the tolerances of the respective vector.